I happened to pass by a Greenwich outlet yesterday and saw the big tarpaulin ad of an "eat-all-you-can" pizza for only P99 from 11am to 2pm. I was also distracted by the crew member beside the tarp encouraging people to try it. Unfortunately, I was on a hectic sched and didn't have the luxury to stay and satisfy my pasta urge till my heart's content. Today, I was able to pass by the same fastfood but with a lighter sched. It took me 5 minutes to decide whether to take the plunge and challenge my stomach or regret it. I'd say, it was a no-brainer. And so, I took a last look at the ad, before entering and ordering myself a "Pizza All You Can" package. Adding P30. will give you your choice of bottomless softdrinks. I'm not a fan of softdrinks but I needed some kind of liquid to help me achieve my goal so bottoms up ! I remember way back in college, Pizza Hut had a similar promo and me and my college pal Mark took up the challenge to see how many slices we could eat. I think I ate 5 slices. I was delighted that the slices available were of their Primo size, which was a Pizza Hut-like slice in terms of size rather than their petite and thin regular pizza. As the ad mentioned, you have a choice of either Pepperoni or Hawaiian. I am not fond of Hawaiian pizza as I believe that pineapples are not a legitimate ingredient of a true pizza. My 1st 2 slices that were served were both pepperoni. My 3rd slice though was served against my will and while I was still finishing my 1st slice. It was a Hawaiian slice. OH NO ! I was set on just asking for pepperoni slices. The tricky part here was that there should be no leftovers before ordering your next slice. 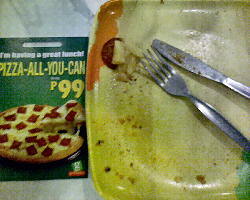 So I had no choice but to consume the pineapple tidbits, which kinda dampened my pizza frenzy experience. I was on my 7th slice when I was set on stopping when the overexcited Greenwich waiter served me an 8th slice. It was a fresh out-of-the-oven pepperoni slice. Oooohhhh !!! I couldn't resist. Hurry ! 5 day promo lang.. ends tomorrow ! 9 slices ha. make it 10 for bragging rights. hehehehe !